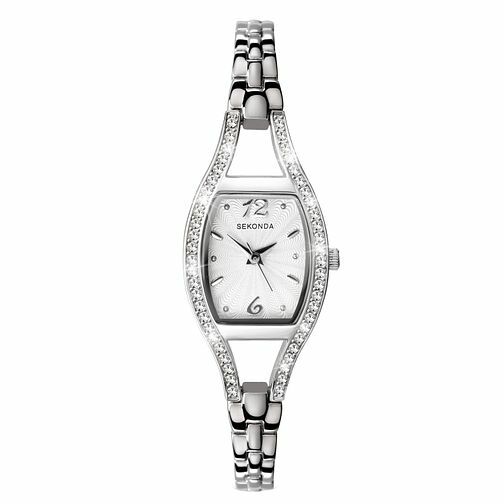 An elegant ladies' watch from leading watch brand Sekonda. Featuring a stone set white dial this stylish bracelet watch is ideal for those occasions when you really want to make a statement. Sekonda Ladies' Stone Set Bracelet Watch is rated 4.7 out of 5 by 11. Rated 5 out of 5 by Anonymous from Lovely little watch This watch is a gift for a friend. I chose it because I have the same watch with a black face. I’ve had it a couple of years and it always looks good whatever I wear it with. There’s a little bit of sparkle but not too much and it’s very stylish. Highly recommended! Rated 4 out of 5 by Anonymous from Looks great. A fantastic watch. Good price and early delivered to shop. Easy to tell the time and looks good.